On November 30th the Supreme Court of Belarus sentenced my son Uladzislau Kavalyou (Vladislav Kovalev) and another young man Dzmitry Kanavalau (Dmitry Konovalov) to death. Kanavalau was convicted in organizing the terrorist attacks in 2005 in Vitebsk, in 2008 in Minsk, and in the subway of Minsk in April 2011. My son Uladzislau was convicted of aiding. The accusations are based on the statements made by these two young men, which, as many believe, were given under physical and emotional pressure. None of what has been said in court is supported by any evidence. My son insists he had not been involved in the terrorist attack and suggested Dzmitry Kanavalau has no relation to them either. I believe that my son is innocent. - The defendants claimed that they were exposed to torture during the investigation to extract confessions. 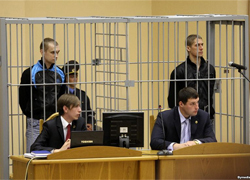 - During the trial, independent journalists were banned from communicating with victims. The official media already refer to Kavalyou and Kanavalau as terrorists without awaiting the decision of the court. With this petition, I am turning to you asking one single thing: I am asking you not to kill my son Uladzislau Kavalyou and Dzmitry Kanavalau, but instead to find those who are actually responsible for these terrorist crimes. PLEASE HELP by signing the petition at Change.org, which will go to European authorities. Русская версия ходатайство: ПОЖАЛУЙСТА, ПОМОГИТЕ СПАСТИ МОЕГО СЫНА ОТ СМЕРТНОЙ КАЗНИ! At the moment Belarus is the only country in Europe, which continues to execute death sentences. And while these two men being murdered, those who are responsible for the attacks are walking freely. Belarus Human Rights Group "Viasna": Stop murder – in the name of the people! Amnesty International: Belarus continues to execute people despite the international pressure, date and time of executions are not made public to the families, bodies never returned.